The lasting identity of Jacksonville’s Downtown Historic District has been secured. 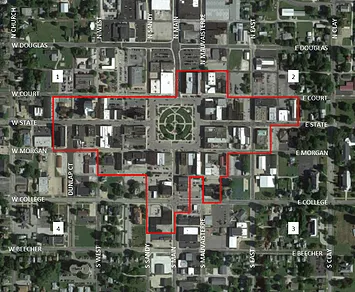 According to a press release issued last week by the Illinois Department of Natural Resources, the Jacksonville Downtown Historic District was one of 30 sites added to the National Register of Historic Places. Though the press release clearly states that the Jacksonville Downtown Historic District was listed on September 14th of last year, the 5-week partial federal government shutdown caused the press release detailing all of the national register listings for 2018 not to be issued by the IDNR until last Thursday. Jacksonville’s district was one of nine historic districts added to the list as part of the latest additions to the national register, which is the official list of properties deemed worthy of special attention and preservation. Commercial buildings in the downtown historic district represent a number of architectural styles from the mid-19th to the mid-20th centuries. According to the IDNR, most buildings in the district have Italianate and High Victorian Eclectic influences. There are, however, examples of other architectural styles, including Romanesque, Revival, Commercial Style, Classic Revival and Modernism. A listing on the national site places no obligations on private property owners, but does make properties eligible for some financial incentives.